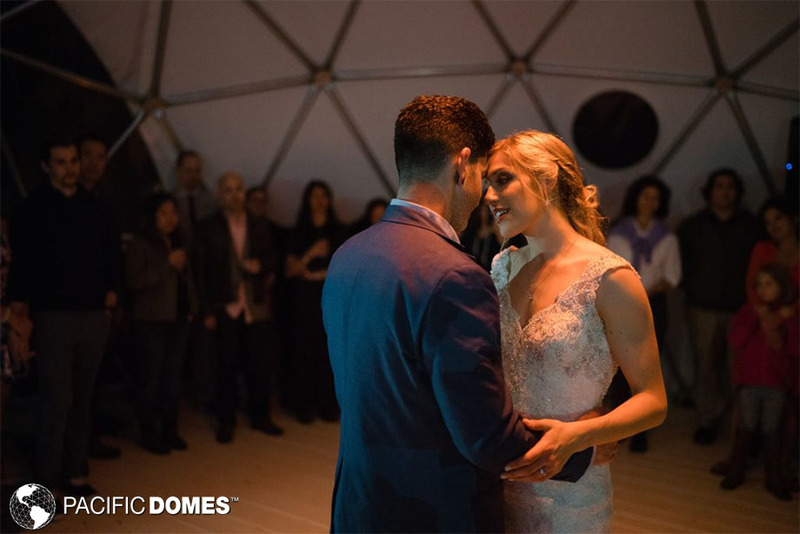 Love is definitely in the air for Ethan and Deanna Kahn, who savored their first dance as man and wife inside a beautiful geodesic wedding dome in the southern Catskill mountains, 90 miles north of New York City. The New York based media researchers are no strangers to living life in style, and set the bar high with their effortless command of all things casual chic. On the rustic countryside property of the Outlier Inn, under a vast pavilion of stars, their dome wedding unfurled like a fairytale of the Instagram age. Dome weddings like the Kahns’ are both exquisitely in fashion and utterly timeless. The elegance and splendor of a geodesic dome’s rounded form as it vaults into the heavens is undeniable. 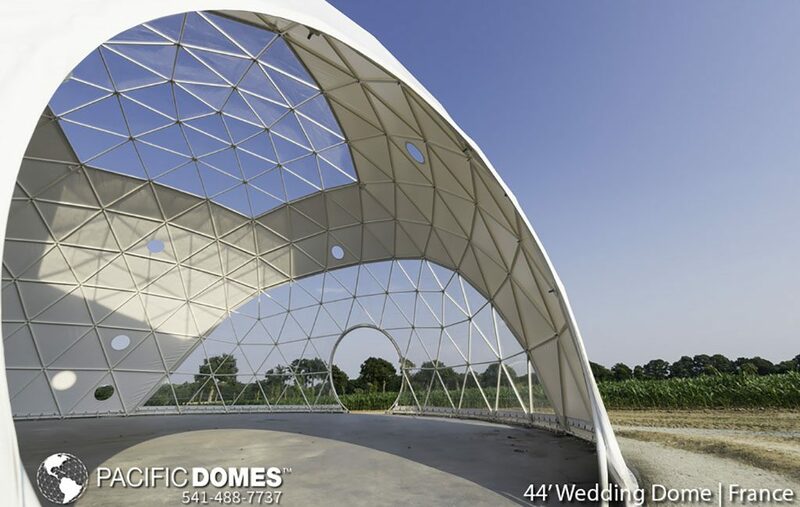 Whether you are inspired by modern or vintage, the sacred geometry of a geodesic dome is sure to speak to your heart as you plan the perfect space for your event of a lifetime. 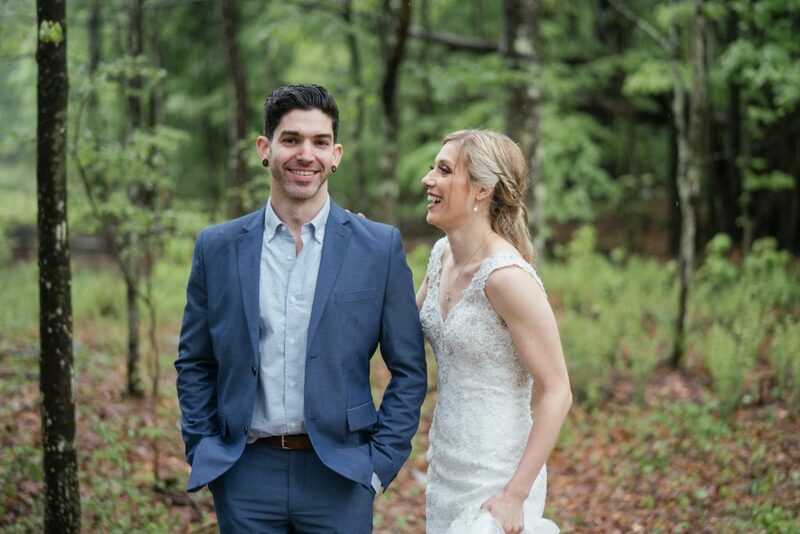 Pair it with a bon fire and a romantic farm-to-table dinner, like Ethan & Deanna, and let it light up the night as a dance floor. Nestled away in the southern Catskill mountains, the Outlier Inn’s wedding dome glows with warmth. After a year and a half of dating, on her birthday, Ethan presented Deanna with a small box. Inside was a necklace with a miniature bottle pendant containing blue and pink stones alongside a rolled piece of paper with an unknown message inside. Although tempted to pull open the cork, Deanna was instructed to wear the necklace — but not to open it. 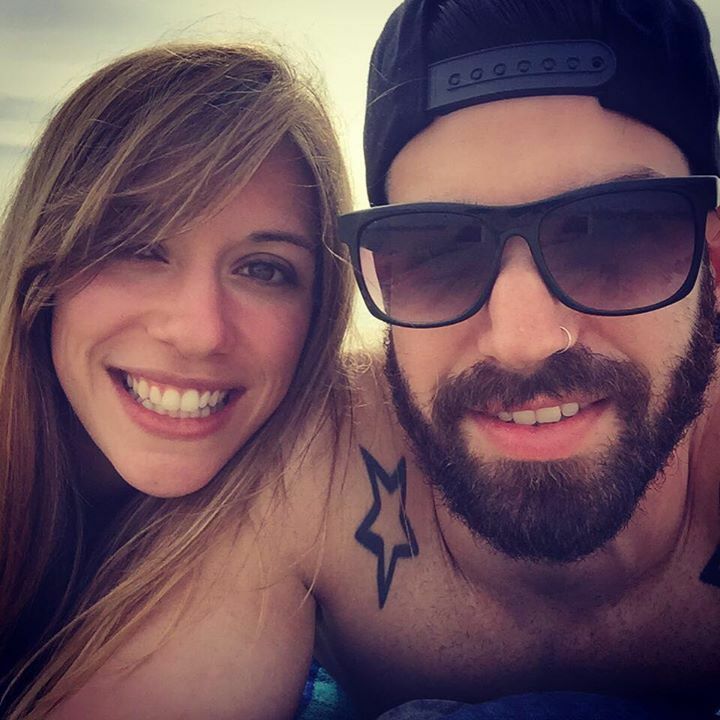 As years went on — two and a half to be exact — Ethan & Deanna dreamed of visiting New Zealand, and one day realized they had enough money to plan a trip. Against the stunning backdrop of Lake Manapouri at dusk, Ethan asked Deanna to get her bottle necklace and take some photos with it. She was a little suspicious of the ask, and just as the sun was setting, she arrived back at the spot by the lake. She handed it to Ethan for a photo and he gently pushed her hand back. Ethan nodded, and she slowly pulled out the cork, hands trembling and tears tumbling down her cheeks. She slid out the paper and unrolled it as slowly as possible so as not to tear it. As far as dreams go, Ethan & Deanna’s story is hardly out of the ordinary… but for this lucky pair, this is more than a dream… it’s their life. It is this easy-flow-of-the-universe feel to their love story, positioning them against a current seeming to swell with fate and destiny, that makes their conscious choices even more intriguing. How did you wind up at Outlier Inn? Deanna: Since family and friends are scattered all over, we were hoping to find a place where people could stay on site with us as well. So I turned to Airbnb. Rather quickly I found the dome in a search and then realized what the Outlier Inn was. There wasn’t a website for the property at the time, so I pieced together the Airbnb pages and messaged the host, who then sent me some cool renderings and details on everything. Deanna: The dome at first was going to be where we had guests sleep, but then when we stepped inside, we knew it had to be our dance floor. The rest of the property was just so amazing as well. The tiny homes and outdoor showers were so very us; when I say I’m passionate about the outdoors, I mean I LOVE the outdoors… and Ethan has grown to love it too. We enjoyed the simplicity of the property, the way that it was self-sustaining, everything about it. 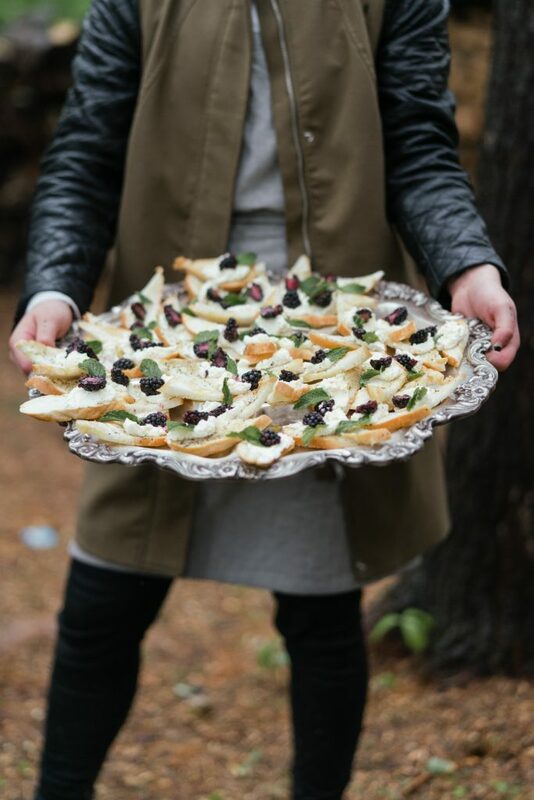 Deanna: We set up a tasting with a local farm-to-table caterer (@chefdeannadeangelo) who I loved because we shared a name and watching her prepare and serve food in the outdoor kitchen —with the Outlier’s animals roaming around and their garden blossoming in the background— sealed the deal for us. We knew this would be a place we could bring our guests that would have a beautiful ambiance, a rustic feel, charm, and overall was healthy — it encapsulated us. 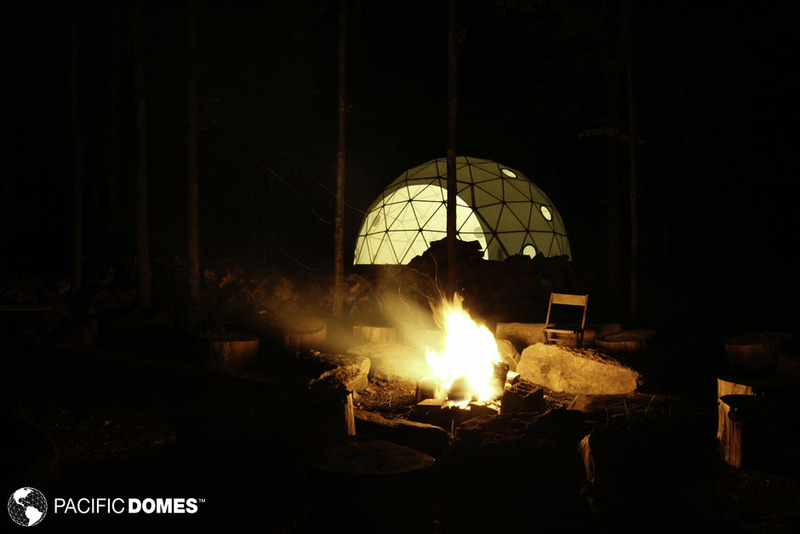 What was your first impression of the Geodesic Dome? Deanna: SO cool. The acoustics in this baby… man! So impressive and such a wonderful design. I love how it opens up and you can have a bit of the outdoors inside; the way it’s partially private but also allows for you to see your surroundings also adds to the mystique of it all. When we found out the lights responded to sound and it lit up in the night, we were stoked. What did your guests say about the Dome? 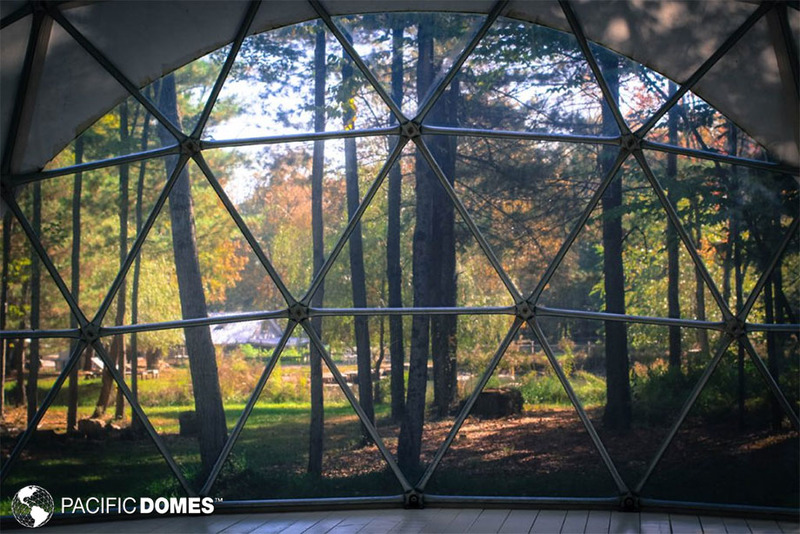 Deanna: When describing the property to friends, I would mention the dome… and they ALL asked to see a picture. They would focus there for the rest of the conversation. Everyone felt it was such a cool addition to an already amazing place. At the actual event, the dome served as our cocktail hour, photo booth, and dance floor, and it was perfect. We were all glad to have it, and everyone loved how big it was, how warm it was, and how it helped us enjoy the outdoors in a whole new way. 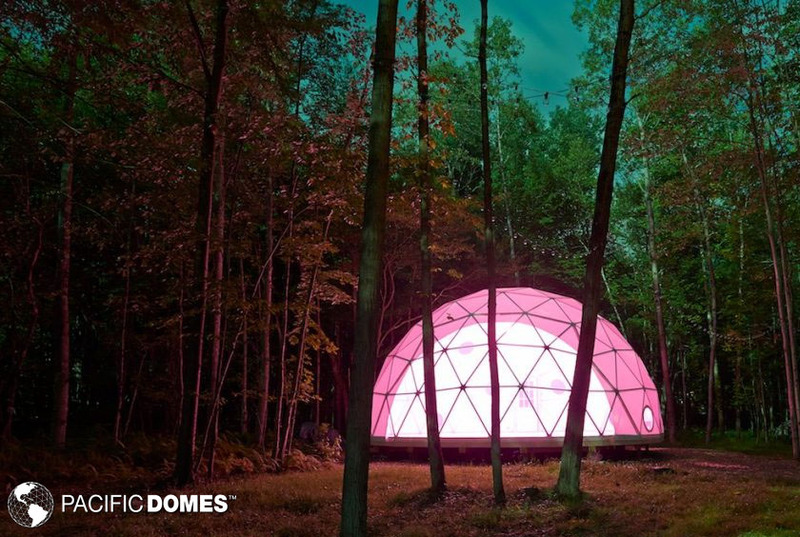 The Outlier Inn’s geodesic dome measures 30 feet in diameter and features the Philips Hue lighting system. The dome is available in season for weddings and special events, as well as a communal glamping space for up to 25 guests. Dome guests are required to bring their own bedding, such as air mattresses, sleeping bags and pads, and towels. 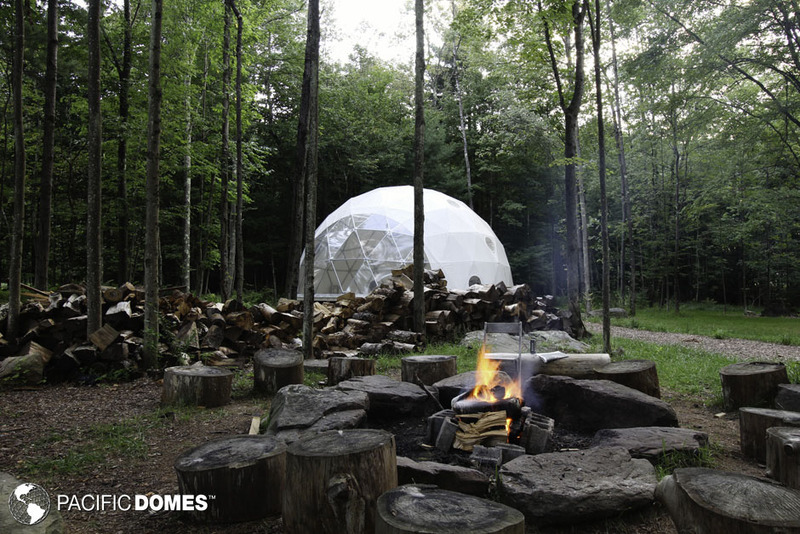 Dome guests have access to the communal outdoor shower, outhouse, outdoor kitchen, and outdoor dining area. Situated on a bucolic 12-acre property in New York state’s southern Catskill mountains, 90 miles north of NYC, The Outlier Inn offers a peaceful and inspiring respite from life in the Big City. It is a retreat center, an event/workshop/location space, a sustainable fiber and organic vegetable farm, and also has a world-class recording studio. 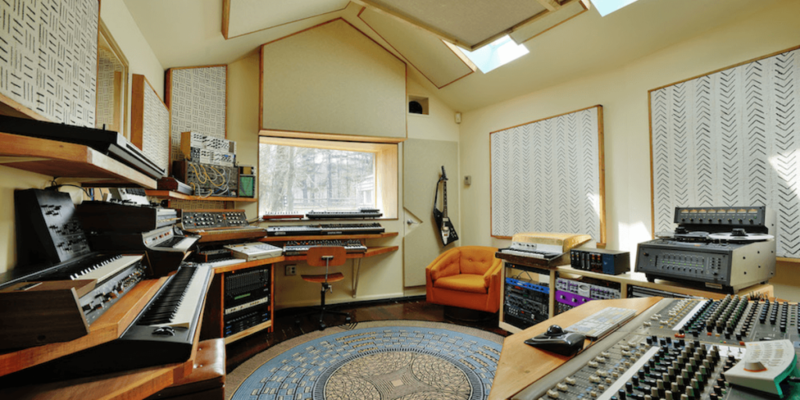 Imagine living in the geodesic dome for a few weeks while you cut a record! 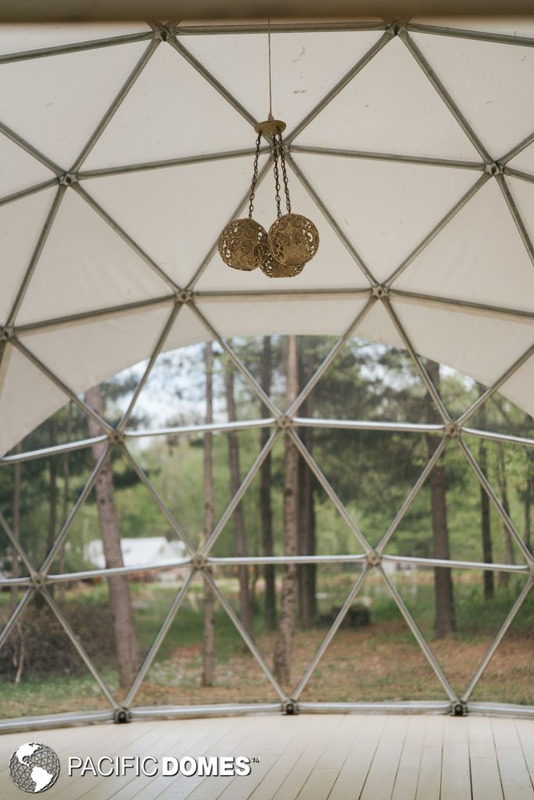 You don’t have to be in New York to live out your once in a lifetime moment under the beautiful arch of a geodesic dome. 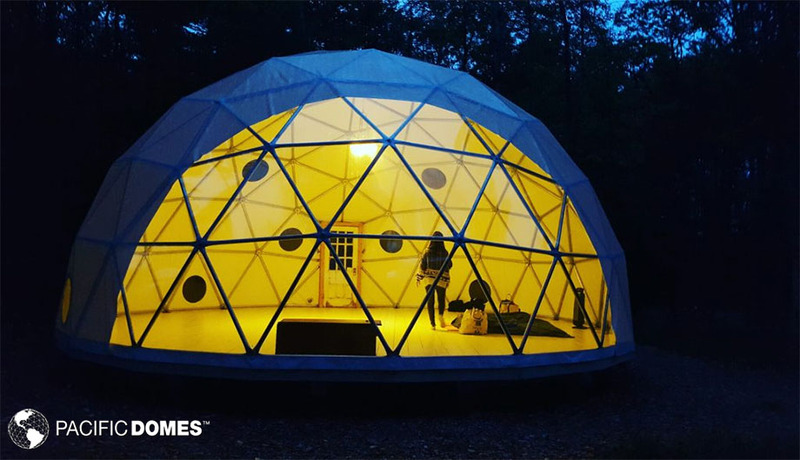 The dome at the Outlier Inn was designed and manufactured by Pacific Domes, Inc., the leading manufacturer of quality geodesic dwell and event domes used for a variety of events worldwide, including festivals, galas and weddings. Wedding domes can be scaled to the size of your dream. 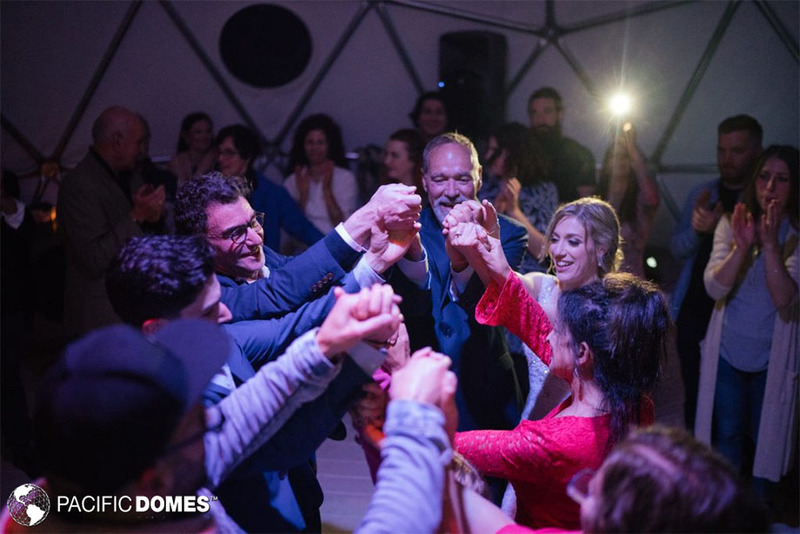 If you are planning to tie the knot, what better way to say your I DOs than within the cathedral-like space of a wedding dome, like Deanna & Ethan Kahn.